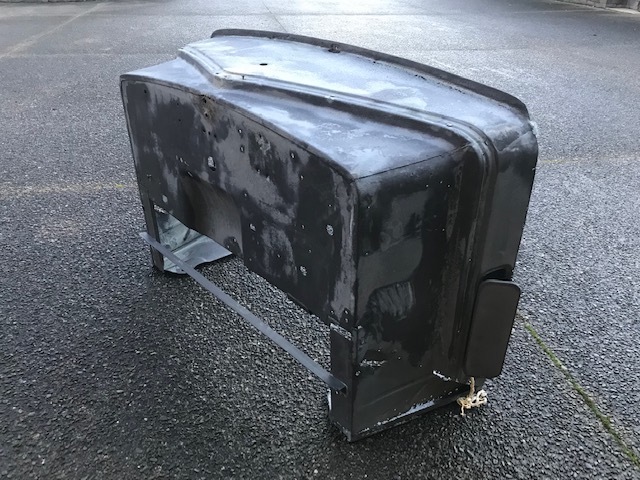 When Steve stripped out the cab last year, we were left with a number of components that were so rusted out, they were beyond repair and not recoverable. An example of the condition of the cab – the left A pillar. 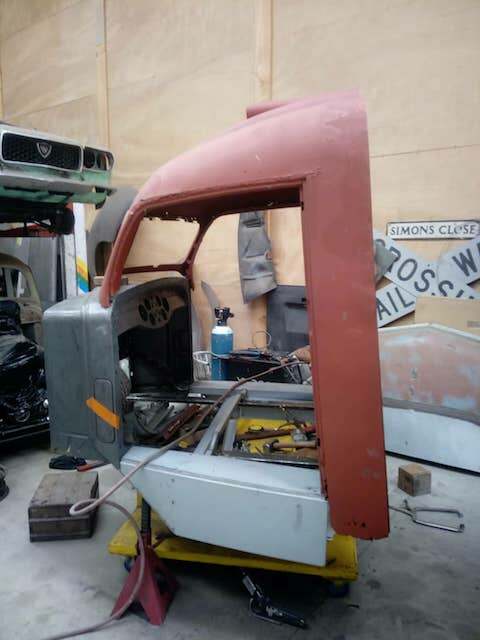 Due to the extensive modifications that Heil had made when building the tank truck, it was not feasible to source a replacement Diamond T 614 cab. 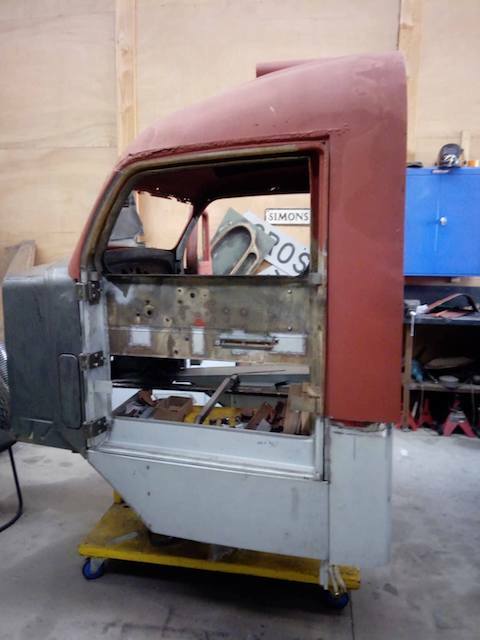 So Steve took all the badly rusted parts including the pillars, the utility box under the passenger door, the sill sections, the seat riser, etc to Alan at Manukau Sheetmetals. 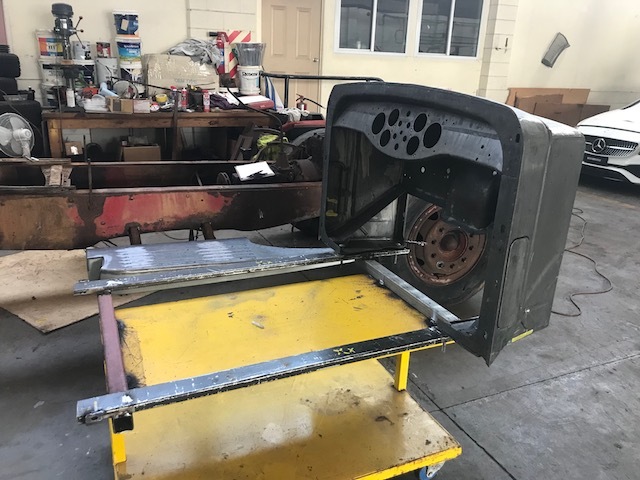 Using these original pieces as templates, Alan fabricated each section and, in doing so, made a significant start on the cab rebuild. The original, lockable utility box that sits below the passenger door. The box is placed upside down in this image. 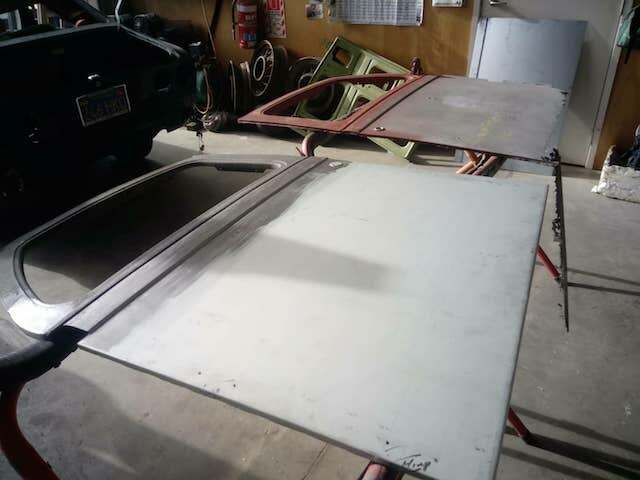 Part way through the fabrication. The completed utility box and sill. 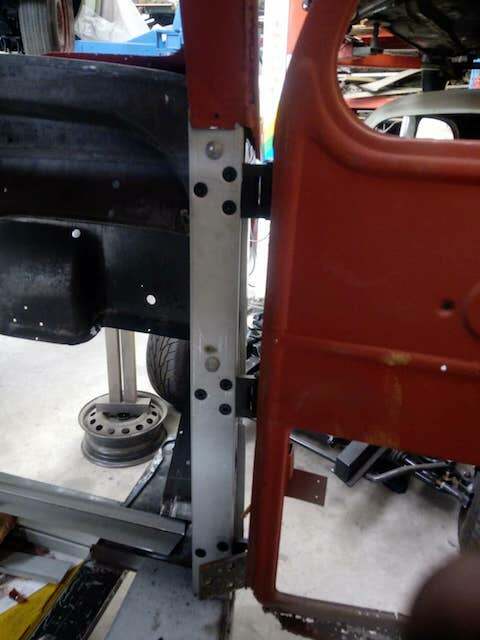 The seat riser, pillars, etc. 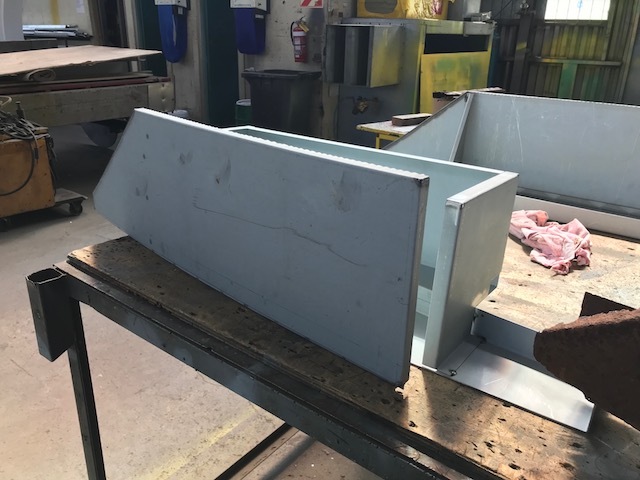 Our sincerest thanks to Alan at Manukau Sheetmetals for the precision and accuracy on these components. 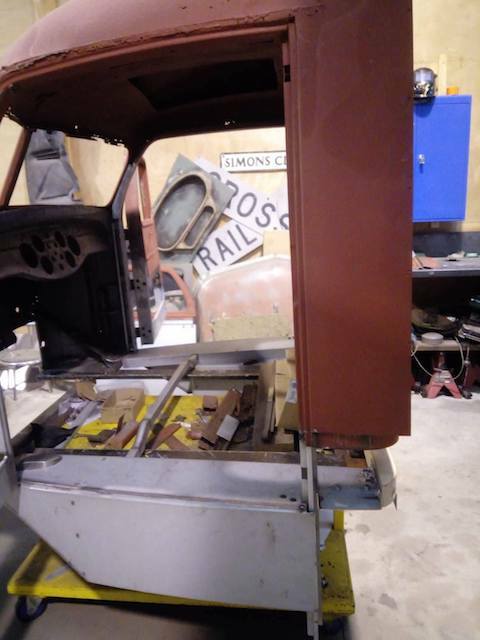 The steel sections he has made, has enabled Simon and Craig to immediately start reconstructing the cab. 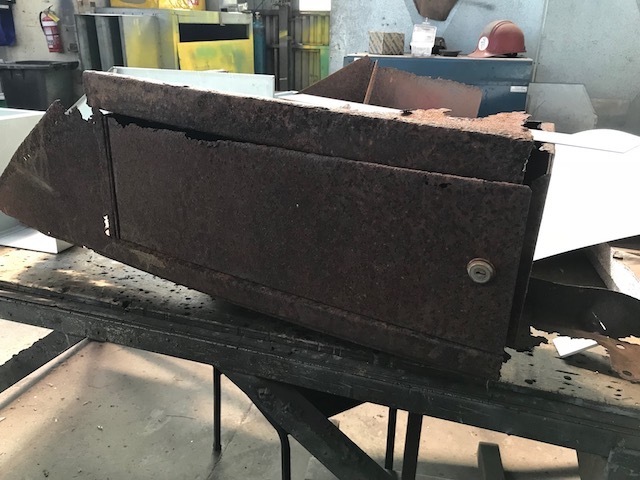 When we published Update # 9, we were waiting until the firewall / cowl was dip stripped to discover the true extent of damage to the steel. 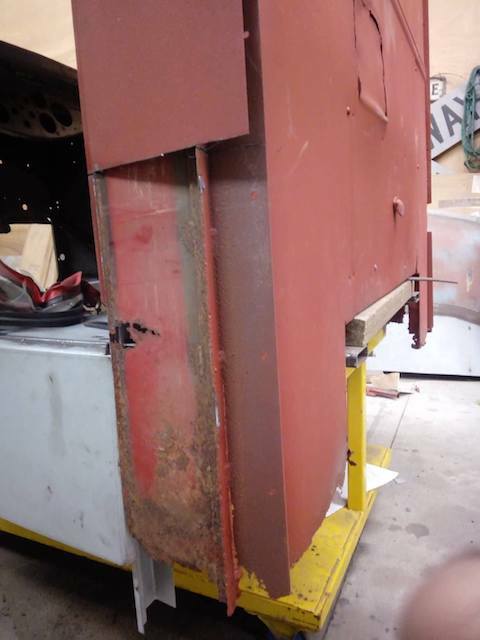 Once stripped and cleaned up, the overall condition was so poor we decided to source a replacement firewall / cowl. An enlarged image of one area indicates the extent of work that would have been needed to repair the cowl frame. 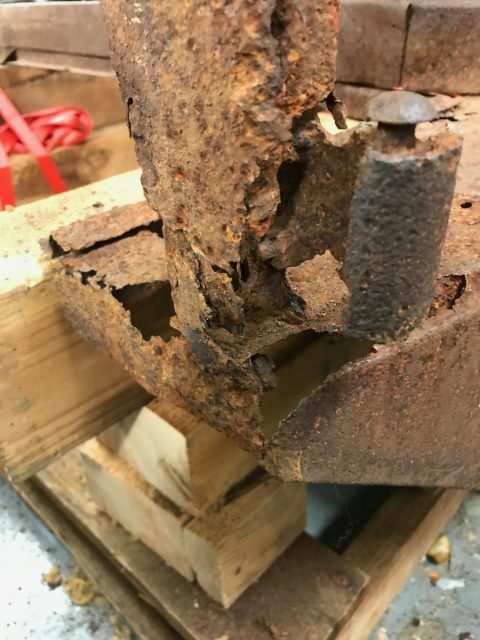 What the image doesn’t reflect, is how thin some parts of the steel is, and the overall lack of strength. 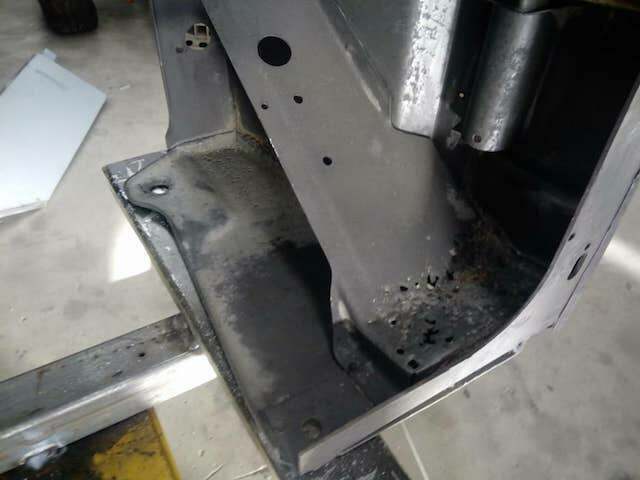 After dip stripping the replacement firewall / cowl, some damaged areas were revealed that require repairs. The overall extent of damage, however, is minor in comparison to the original steel structure. 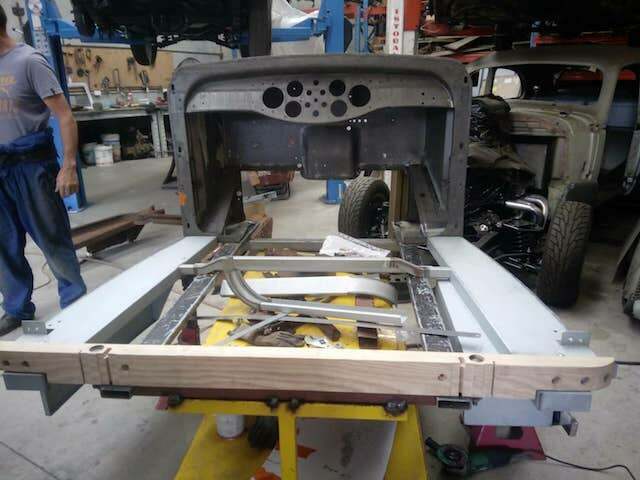 To avoid having to deliver the entire chassis out to Creative Metal Works, Steve constructed a mobile jig for the cab to be rebuilt on. 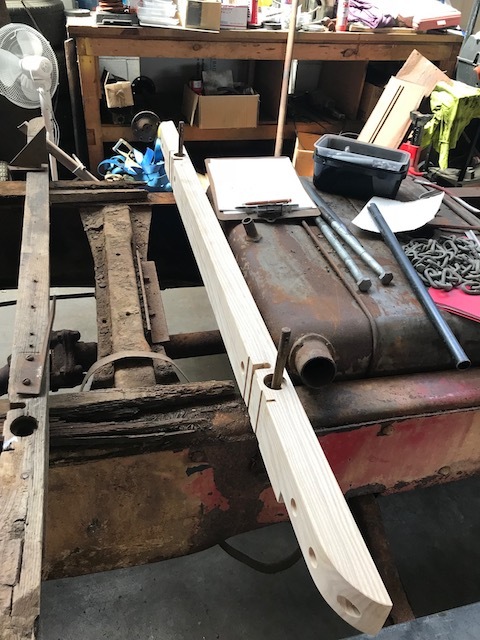 He replicated the chassis rail width, sourced and drilled the corresponding holes and then tack welded cross bracing to reproduce the dimensions of the chassis. 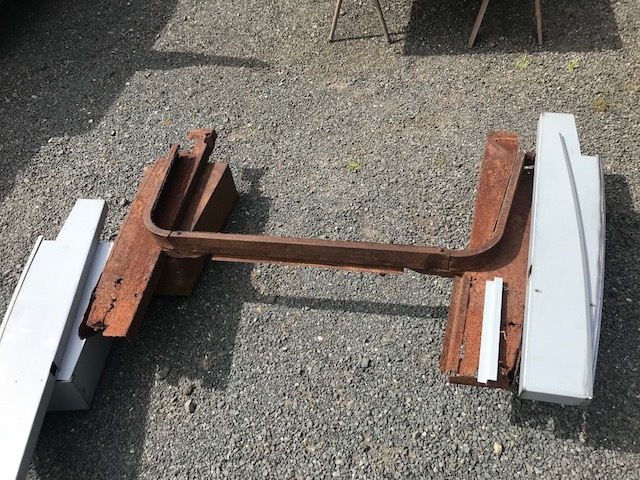 The jig rails were then transferred on to a mobile trolley and welded into place, and the temporary cross bracing was removed. 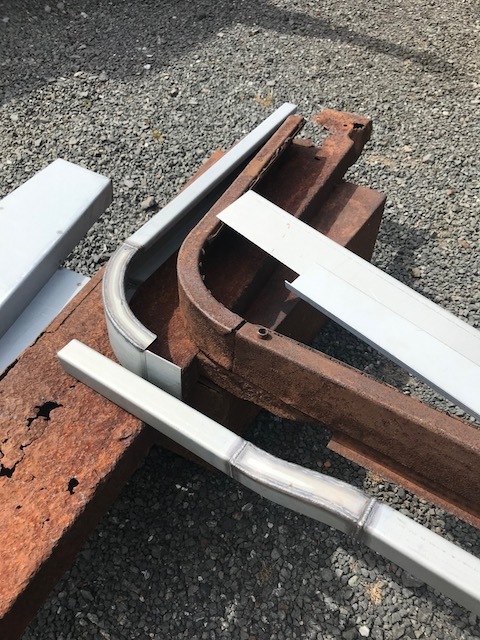 When we began the restoration last year, we sourced some new, old stock hinges from LwDParts in the Netherlands. 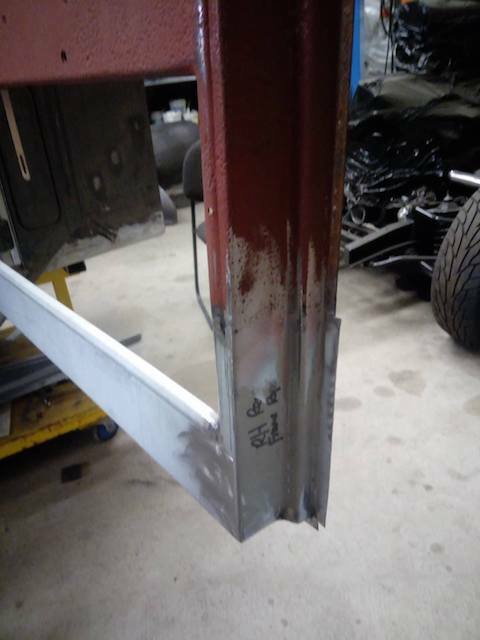 Earlier this month, the hinges were delivered to Creative Metal Works along with the jig and fabricated sections. 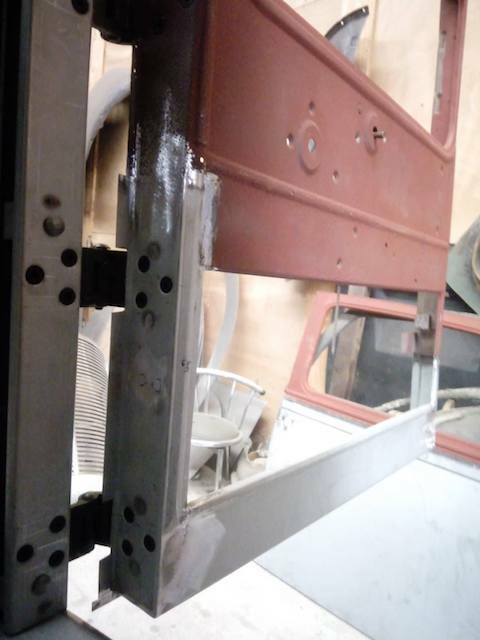 In preparation for attaching the hinges to the cab, bolt holes were countersunk in to the A pillars. 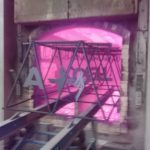 Inner supports were made up and the pillars welded together. 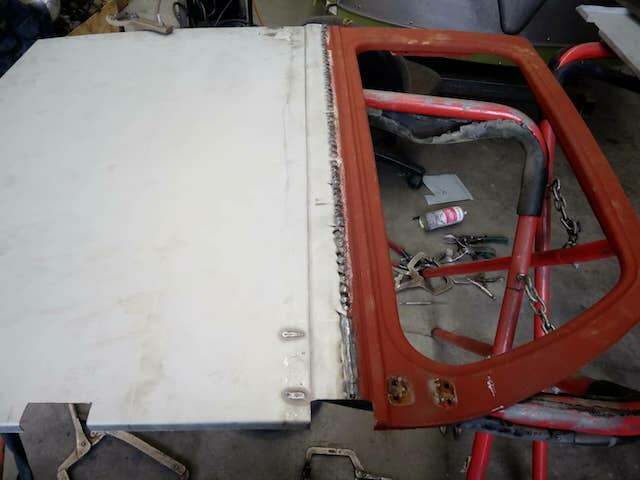 The first panel to be repaired when the restoration began was the driver’s door, and extensive repairs were needed to both the frame and the skin. 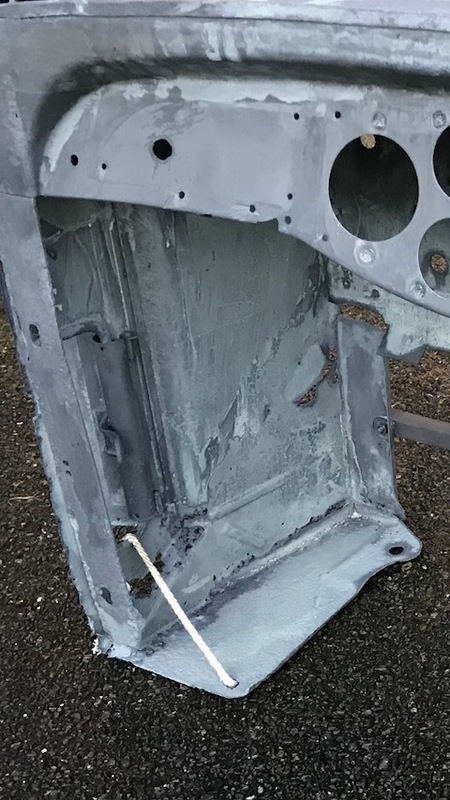 Being in a similar condition, the passenger door required the same repairs. The repaired driver’s door skin is in the forefront of the image. 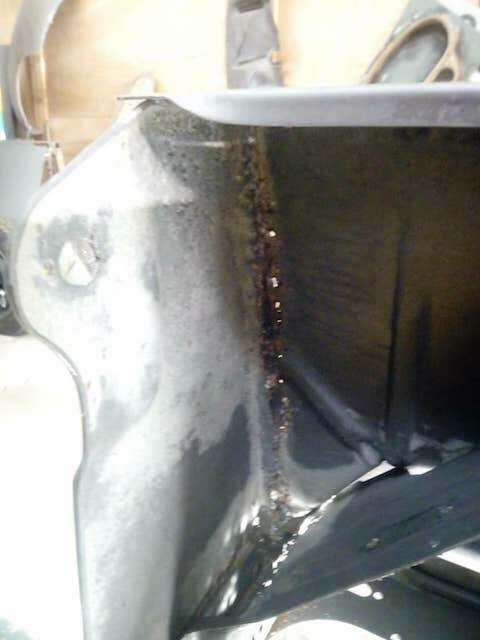 The rusted bottom edge of the passenger door skin is hanging off in the background. Various stages of the door skin repairs are captured in the images above. 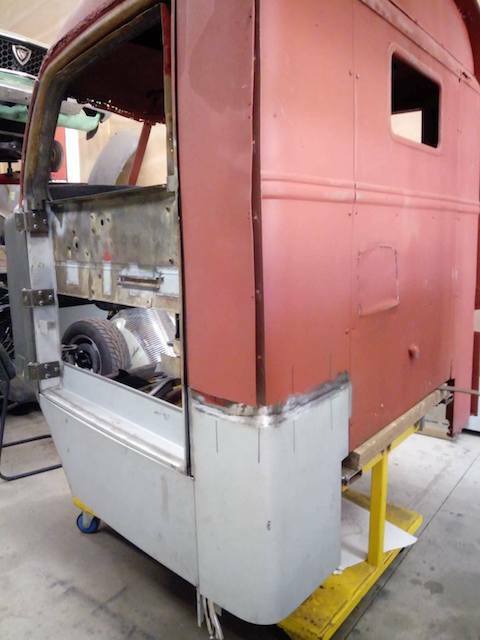 A new skin was made up from the centre swage down, and tig welded to the window section of the passenger door skin. Holes were then cut in both door skins to accommodate the hinges. A perfect pair. The driver and passenger door skins side by side. 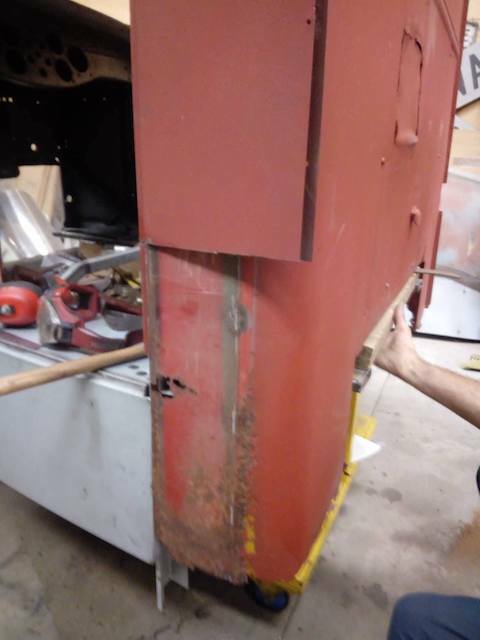 Our thanks to Tom Andrews for helping once again by getting a timber brace replicated that supports the bottom of the back of the cab. The original brace can be seen at the left of the image. 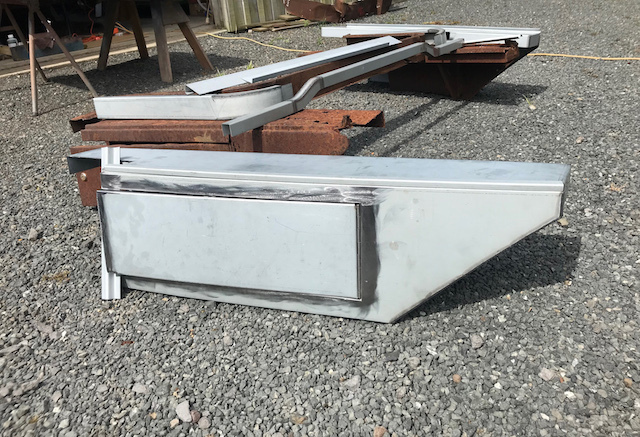 The right hand inner cowl toe board frame was removed, rust repairs were made and the section was then welded back into the cowl. 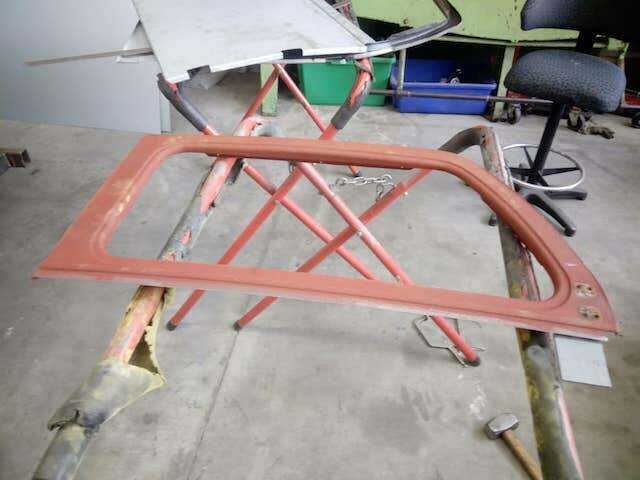 Rust repairs were also made to the right hand lower cowl outer skin and inner frame, and splits were welded up in the cowl panel. 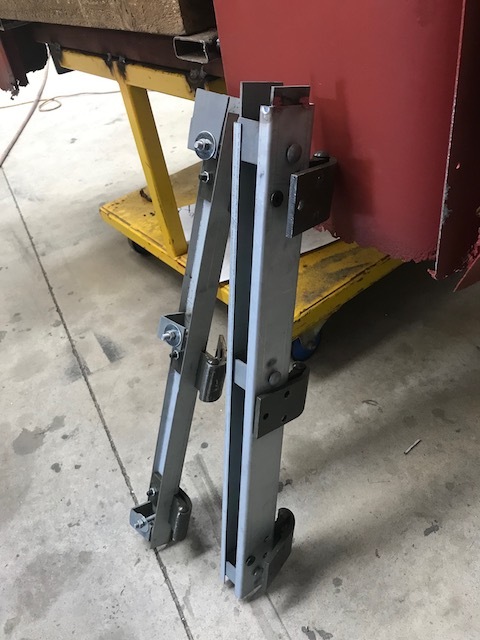 With the base of the cowl frame bolted to the front of the jig, the timber brace was placed at the lower rear of the cab. 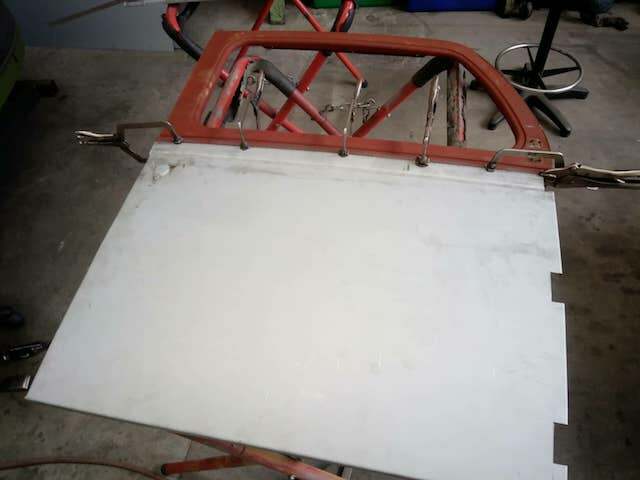 The sills and lower side panels were then positioned and attached. 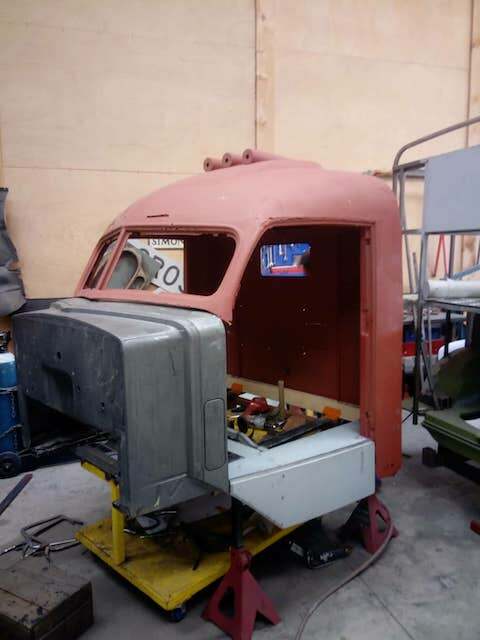 Once the streamlined roof and back wall structure was bolted in position, the Diamond T cab began to re-emerge. 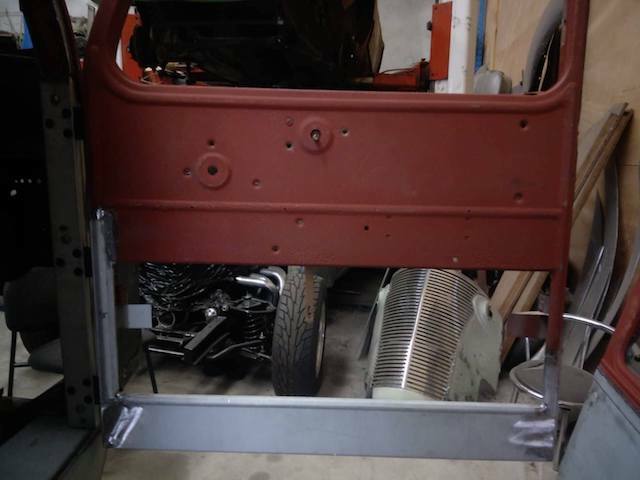 The door frames were bolted up and body adjustments were made for the door gaps. 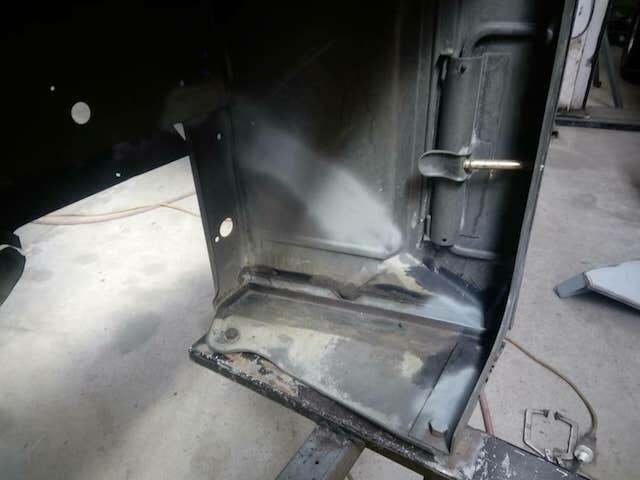 With the door mounted on the cab, these images show the severe rust and damage across the bottom of the passenger door frame. 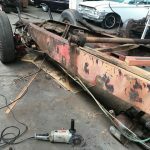 Repairs were made to the bottom of the frame, and the passenger door was mounted again prior to these images being taken. 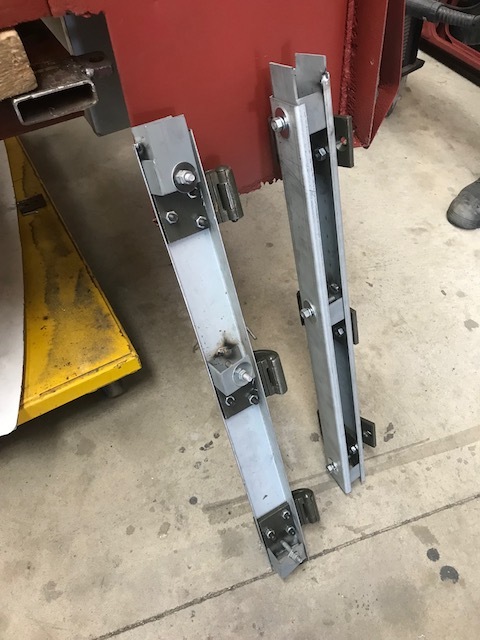 As a temporary measure, the doors have been mounted using allen head screws. 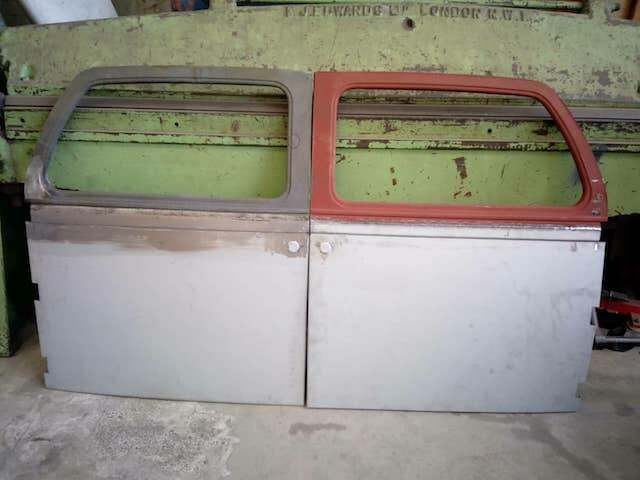 Once the cab has been painted, these will be replaced with period correct slotted head tapered screws. 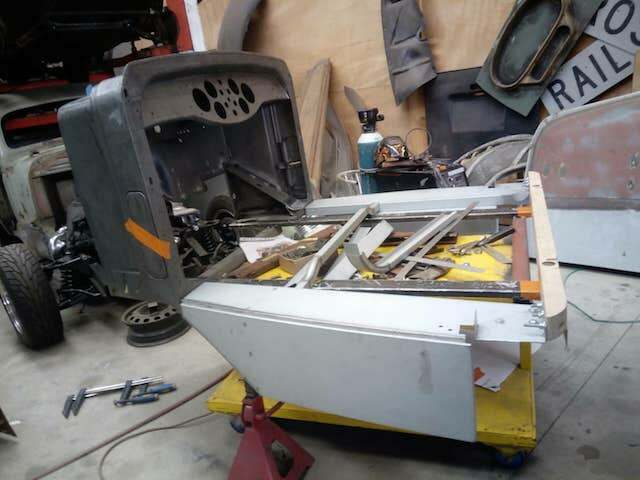 To align the streamlined tank with the Diamond T 614 model, Heil made a false outer skin on both rear corners of the cab. 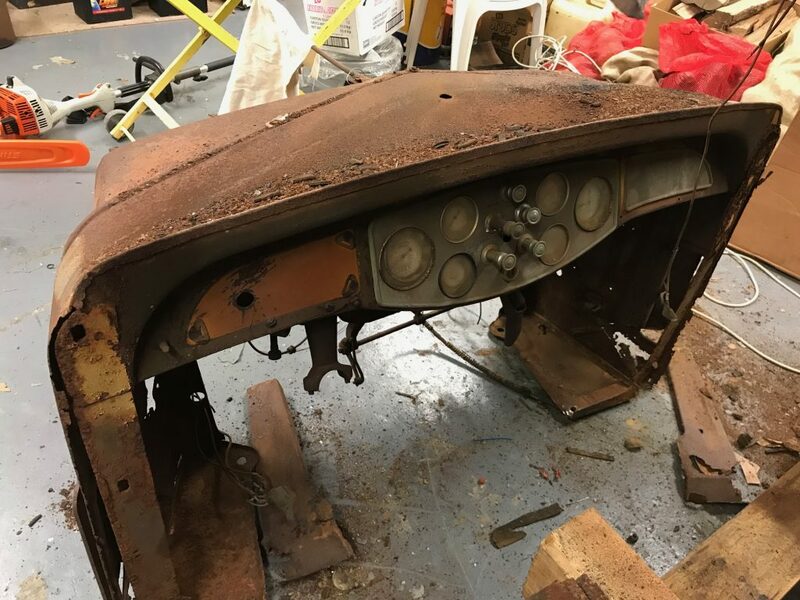 To access and repair these corners, the left hand lower outer skin was cut away to expose further damage on the original cab wall. 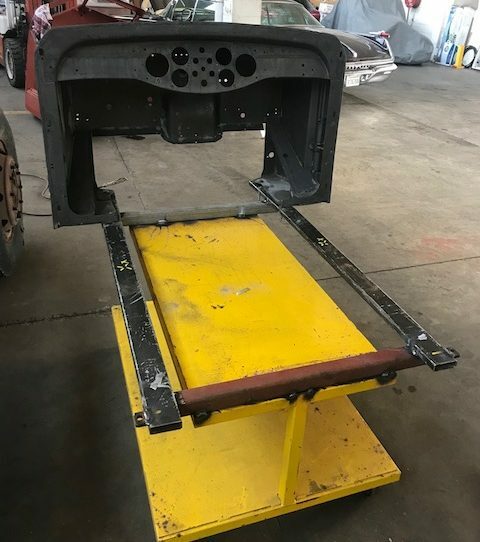 The original lower cab corner was then cut out in order for repair sections to be made. 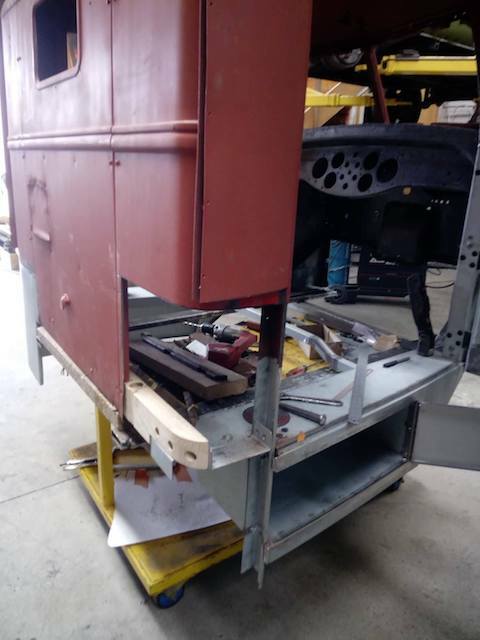 A repair section was folded up and welded back in to the left lower area at the rear of the cab. With similar damage on the opposite corner, the affected area of the right hand cab wall and the false outer skin have also been cut away. 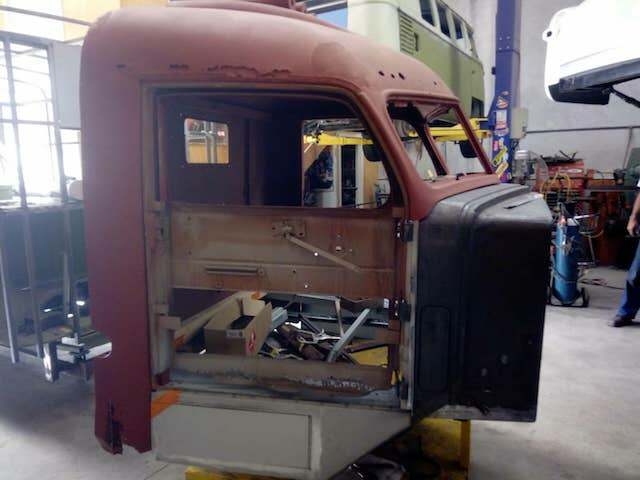 We are thrilled that the decision to preserve the doors and the modified Diamond T 614 cab body has worked out so well. 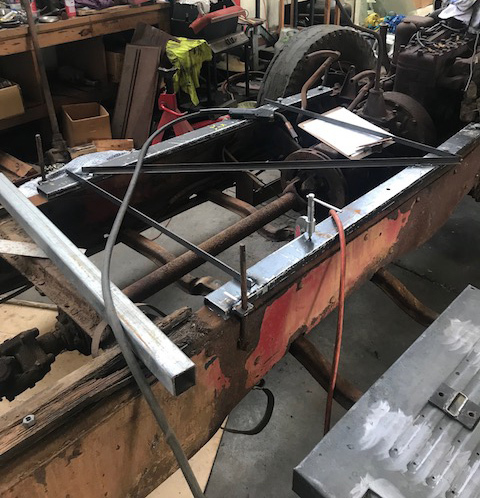 There is still work ahead at Creative Metal Works to repair the roof and windscreen area, but a lot of progress has already been made to reinstate the cab. 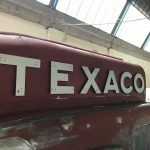 Our thanks and appreciation to Simon and Craig for a fabulous start to the cab rebuild. With every update I receive I am in awe of your dedication to this monumental task. 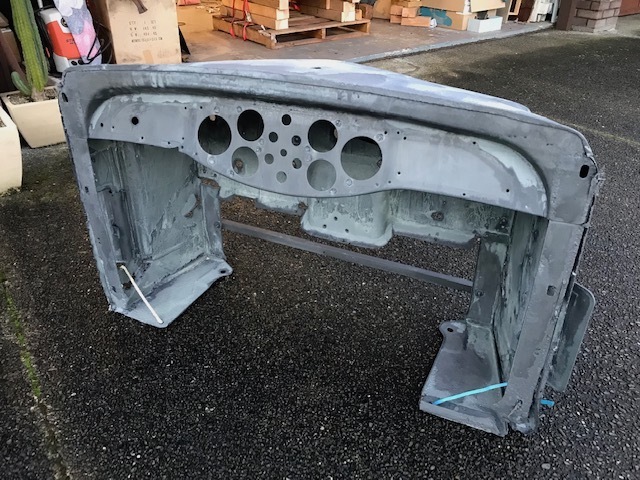 I restored my 1970 Ford Torino which was tired but very solid. The amount of that work was daunting. Your task is over the top. I look forward to the day it is complete and on the road. Best wishes. Thanks so much Andy. We very much appreciate everyone’s interest and support with this project. Thanks John. We couldn’t agree with you more. As a retiree of “big oil” (not Texaco) I am fascinated by this build. 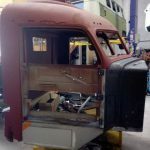 We are very fortunate to be working with craftsmen who are genuinely interested in the project, and share our commitment to see this historic truck brought back to its original form. Thanks for following the build Frank. This is a great project to follow. I’m looking forward to seeing it in the flesh once completed. 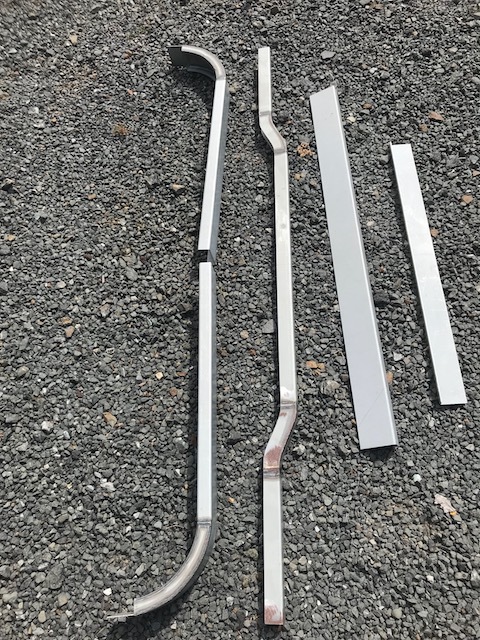 Where did the replacement cowl come from? 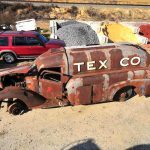 It came from another local Diamond T that is awaiting restoration. We now think we have found a firewall / cowl for that truck to replace it. Thanks Rick. You are just short of re-manufacturing the whole truck. That is a lot of work, but it is a very worthy project. Can’t wait to see the finished product. Thanks Jerry. 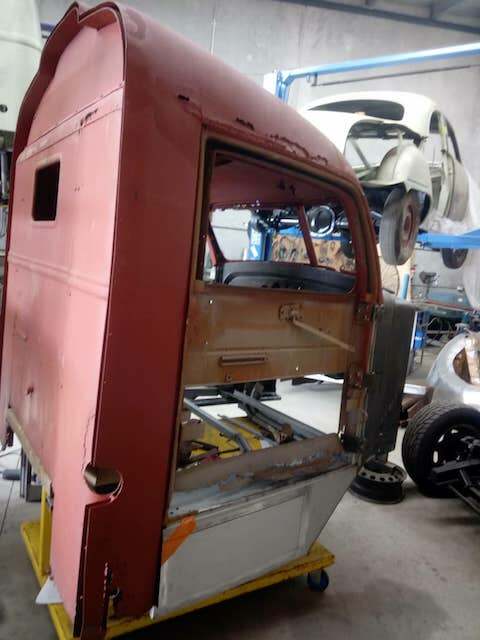 We are almost there on the body work.